Watch over your home in crystal-clear 1080HD video, and see, hear and speak to visitors from anywhere. With instant mobile alerts and two-way talk, you can answer the door from your smartphone, tablet and PC. Ring lets you adjust your motion sensors so you can find the ideal setting for your home. You’ll get instant alerts when motion is detected, allowing you to protect your property from the comfort of your smartphone. 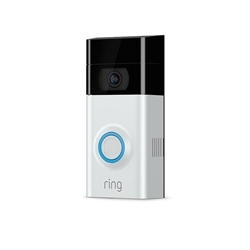 Video Doorbell 2 works on any home and includes a quick-release rechargeable battery, so you can charge your Doorbell without removing the device. Get two battery packs, and you'll never worry about power.